To form a guild, a player above Level 30 not belonging to a guild must have access to 2 million crones for the founding fee. 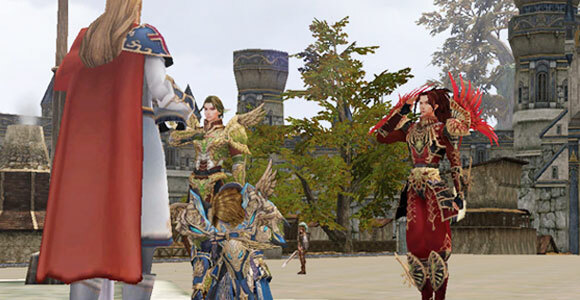 Guilds can be founded via Guild Manager NPCs positioned in each town upon completing the guild creation quests. 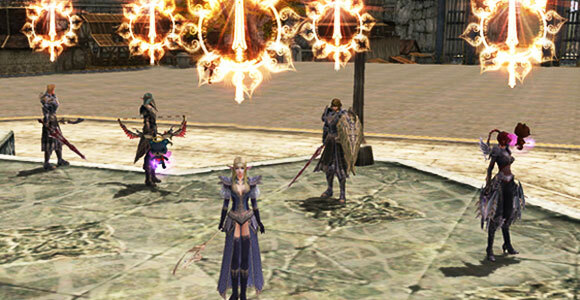 Ordinary players can join guilds by Guild Invitations extended by guild masters. Allows guild masters or those invested with guild master authority to send messages to all guild members. 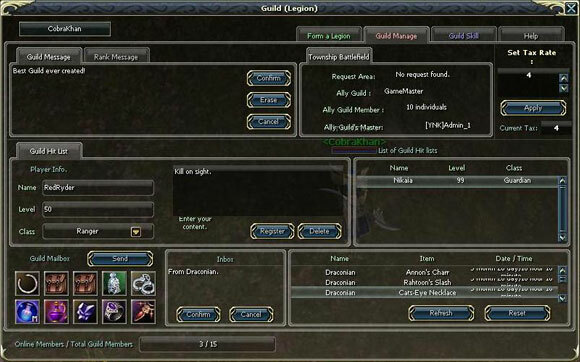 Guild messages can be viewed upon logging in or via the Guild window (hotkey G). Displays a guild's Township Battle statistics. Any guild member can view information on a range of subjects from battlefields to ally guilds. Only guild masters can draft this list of malicious players making it available to all guild members. Vengeance does not apply to the Guild Hit list. When a guild master requests an item needed by the guild, long-distance inter-guild transactions are made via automatic deposit into the guild treasury obviating the need for travel. Up to 10 items can be sent in a single transaction. All guild members can donate a desired amount of crones to the guild treasury. 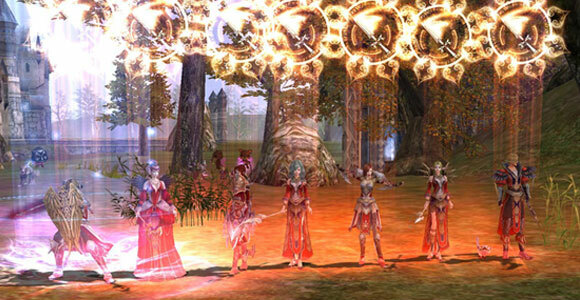 Donations can be used to raise funds for inter-guild events and Township Battle preparation. Members are restricted from rejoining any guild within 7 days after withdrawing. Members are restricted from rejoining any guild within 8 days after being kicked out. 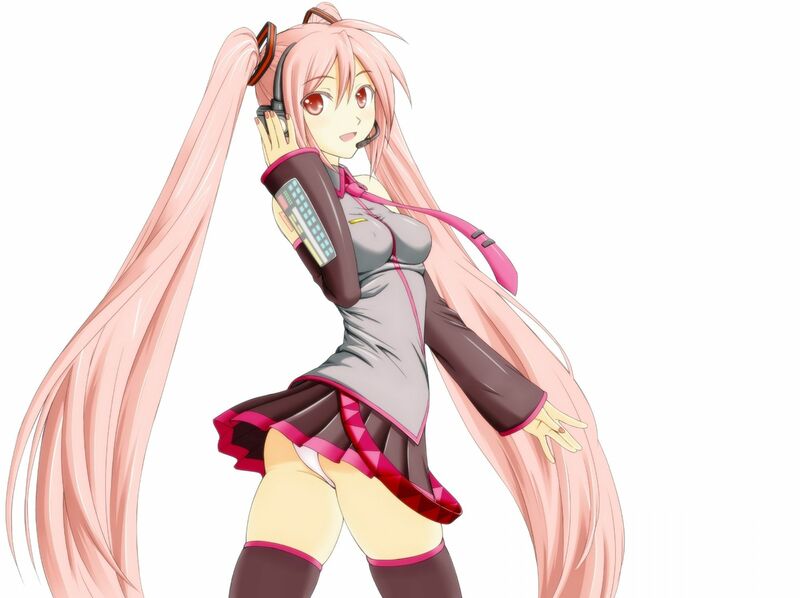 System will alert a message displaying the time remaining until one can become a guild member. Guild masters can use guild points acquired via Township Battles and guild stones obtained from monster hunts to purchase skills needed by the guild. 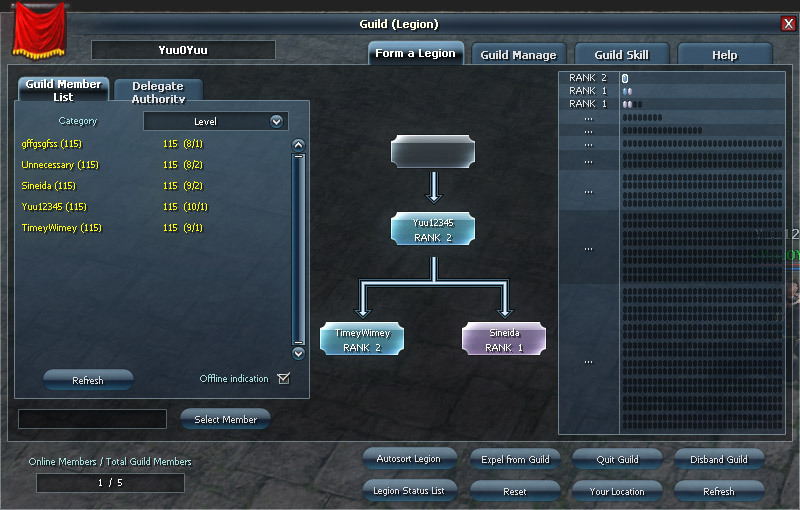 Only guild masters are allowed to use guild skills, and a maximum of 8 guild skill effects can be applied to an individual.